Greetings, Stampers, and Happy Labor Day! I hope you are having a nice relaxing weekend. I enjoyed sleeping in this morning. Soon I'm off to the gym, then later maybe some shopping. I'll be sure to leave some time aside for stamping, too. I have a big stamping to-do list to work on! One of the things on my to-do list is birthday cards. I have so many birthdays on my calendar for the month of September. About half of them are males, so I'll need quite a few masculine cards. This one manages to be colorful and manly at the same time, I think. The collage, which almost looks like DSP, was created with the By the Seashore Stamp Set. This was one of my must-have sets from the current catalog. You can do so many things with it and it is perfect for masculine cards. 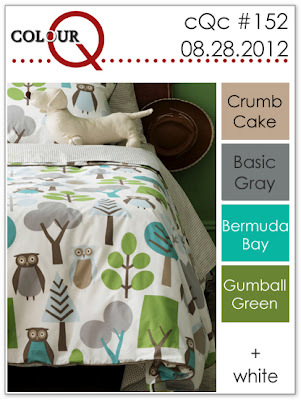 The color scheme came from this week's ColorQ Challenge. I didn't have Bermuda Bay, so I substituted Tempting Turquoise which is pretty close.These colors are great for a beach inspired card and worked perfectly for my project. The layout is compliments of Freshly Made Sketches. 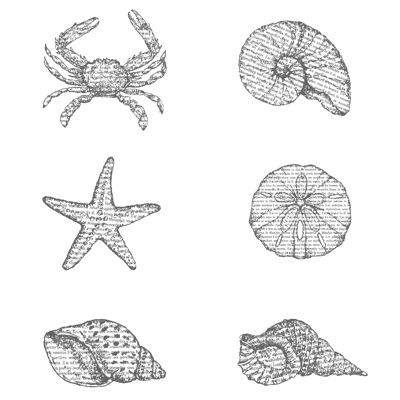 They always has such great, simple sketches that allow a lot of room for interpretation. I love playing along with their challenges. The images were stamped randomly atop of one another. 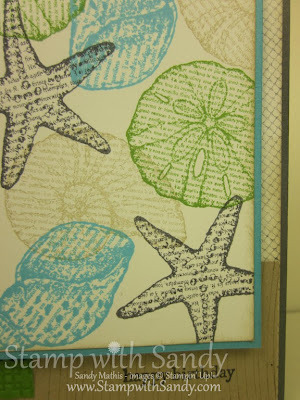 Two background stamps, Woodgrain and Netting, keep things interesting without being too fussy. Everything was sponged on the edges with a little Crumb Cake Ink. Great masculine card Sandy! 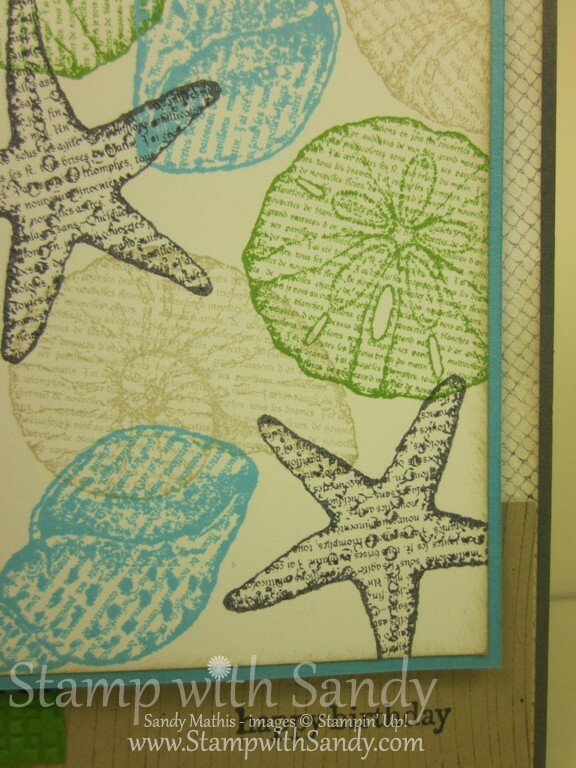 I really like the use of the two different background stamps! I think that netting stamp is a must have! Great colours choices! Thanks for joining us this week at Freshly Made Sketches! 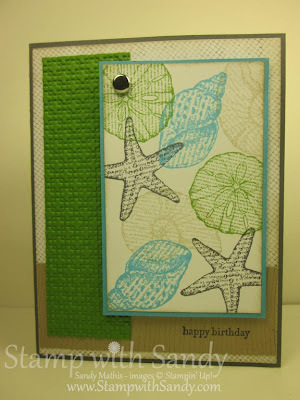 Wow .... what a great card this is ... love your creative stamping, love the colours and love the texture! This is very nice, Sandy! Those shells are the perfect images for those colors! 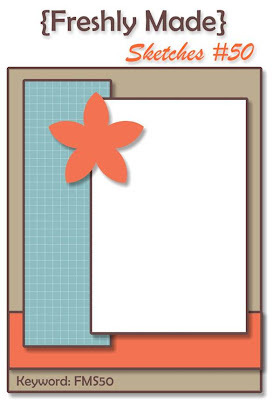 What lovely images for the colors, Sandy, beautiful card! Thanks for joining us at the colourQ and sharing your card. Beautiful, Sandy! Such rich texture and fabulous colors! Thanks for playing with Freshly Made Sketches!